Background: Trauma-induced coagulopathy (TIC) portends poor outcome in severely-injured children. The kinetics of coagulation dysregulation after injury have not been delineated. Transfer to pediatric trauma centers is common; time from injury to laboratory testing is therefore highly variable. Methods: Severely injured children age<18 with rapid thromboelastography on arrival and documented time of injury were evaluated. Standard definitions of hyperfibrinolysis (HF; LY30≥3), fibrinolysis shutdown (SD; LY30≤0.8), and physiologic (LY30=0.9-2.9) were applied. AIS score≥3 defined severe traumatic brain injury (TBI). Variables of interest included demographics, injury mechanism, medications, mortality and functional disability. Results: 285 patients were included: median(IQR) age=11(6-15), injury severity score=17(10-25), 75% blunt mechanism, 32% severe TBI, 11% mortality, 28% disability. None received antifibrinolytics or blood products prior to arrival. Physiologic phenotype was predominant within 1 hour of injury (51%); beyond 1 hour, SD was most frequent (1-3 hours = 46%, >3 hours = 59%)(FIGURE 1). Patients with TBI had significant increase in incidence of SD beyond 1 hour after injury as compared to non-TBI patients. 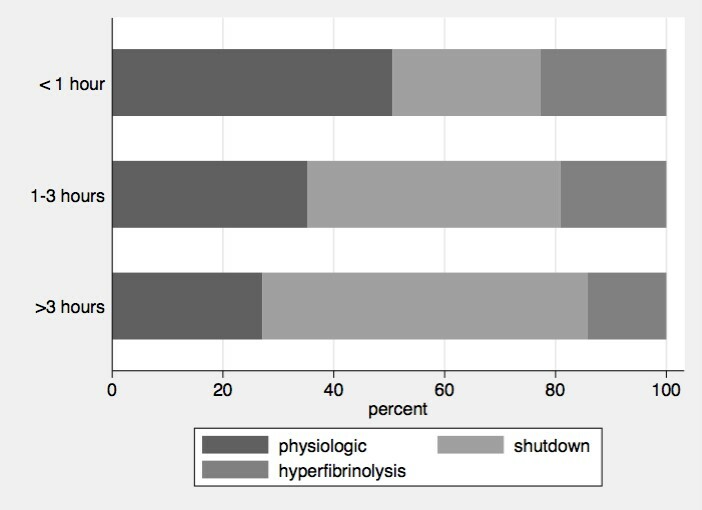 Physiologic fibrinolysis was associated with survival at all timepoints (p= 0.005). Conclusions: Fibrinolysis shutdown is a reactive response to injury associated with poor outcome. Our data suggests that there is an early and brief opportunity to mitigate the progression to TIC. Further studies should focus on understanding the dynamic events occurring immediately after injury to identify specific targets for intervention.